The administration cancelled a trade meeting and warned tariffs were coming. News reports broke claiming the White House had cancelled a trade planning meeting with China this week because of outstanding disagreements over intellectual property rules. The scheduled meeting was to plan topics to be discussed with Vice Premier Liu He at the end of January. Reportedly, the White House told the advance party there was no need to show up if they were not prepared to provide assurances of progress on the intellectual property complaints. The threat of increased tariffs already scheduled for March 1st, was repeated. 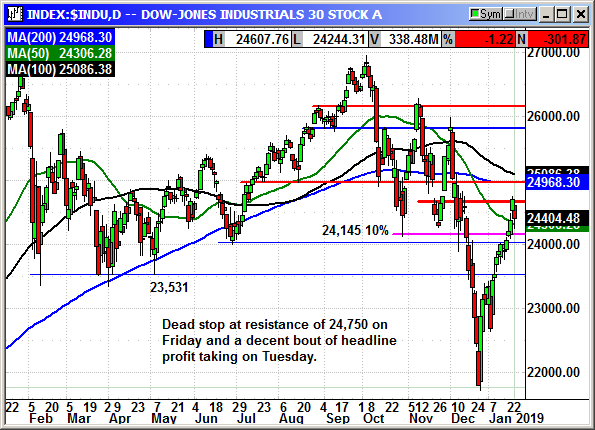 The market collapsed with the Dow trading down -467 points at the lows. Just before the close, Larry Kudlow, head of the NEC, denied on CNBC that a meeting had been cancelled. He said the report was "totally inaccurate." He also said there had not been any intermediate meetings scheduled other than the visit by Liu next week. 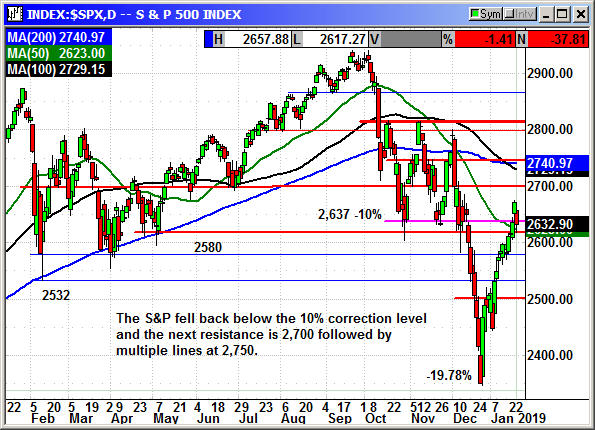 The market immediately rebounded but the clock ran out on the recovery. Adding to the negative bias this morning was a sharp decline in existing home sales to the lowest level since November 2015. December sales fell -6.4% from November and -10.3% from December 2017. Sales declined to 4.99 million, annualized, and there was weakness in all four regions. On a year over year basis sales were down -6.8% in the Northeast, -11.2% in the Midwest, -5.4% in the South and -1.9% in the West. Months of supply declined from 2.9 to 3.7 months and the lowest in a year. Median prices declined from $257,300 to $253,600. This decline is for December, so it had nothing to do with the shutdown. 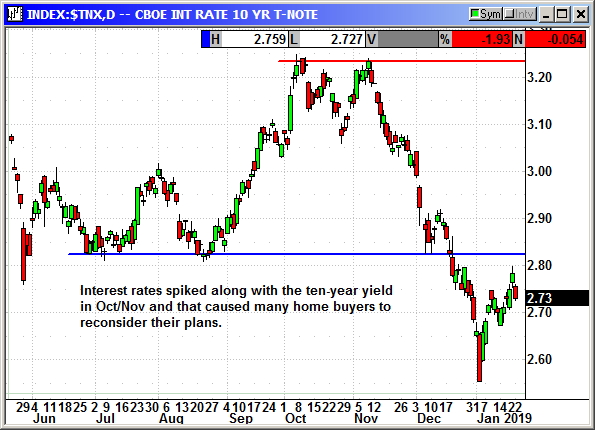 The key was more than likely the spike in interest rates in Oct/Nov and that caused many potential home buyers to reconsider their plans. This report is based on closings and contracts would have been signed in Oct/Nov. Now that rates have declined again there has been a spike in the mortgage applications in January. For the week ended January 4th, applications were up 23.5%. For the week ended on the 11th, applications were up 13.5%. 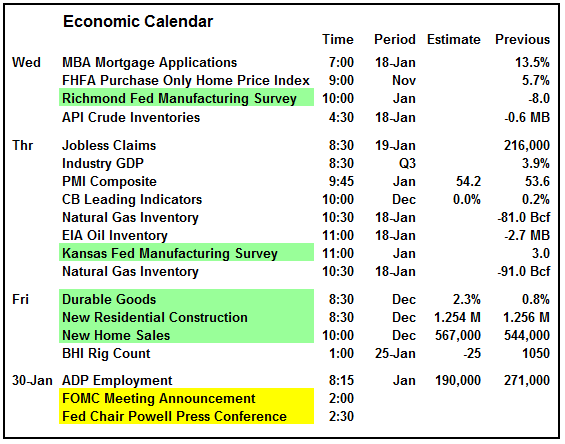 The economic calendar for the next two days will take a backseat to earnings. The Richmond Fed survey and Kansas Fed survey are not normally market movers. The next economic hurdle will be the housing starts and new home sales on Friday. 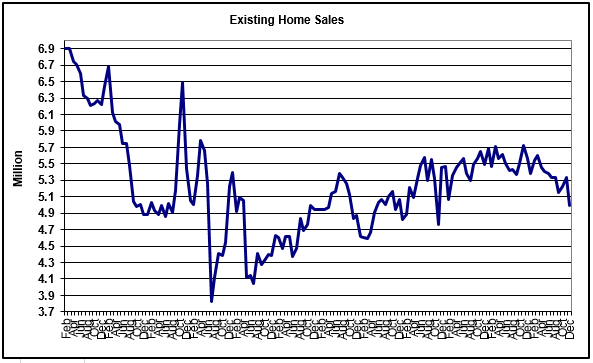 If they come in as bad as the existing home sales, it could drag the market lower. The FOMC meeting the following week normally sees a positive market the Tuesday before the announcement. I just hope we do not have to wait that long for investors to shake off the China blues. The big guns on the earnings calendar for Wednesday are Texas Instruments, United Technology, Procter & Gamble, Ford and United Rentals. As of 10:AM this morning 61 S&P companies had reported earnings for Q4 with 14.1% earnings growth and 5.7% revenue growth. 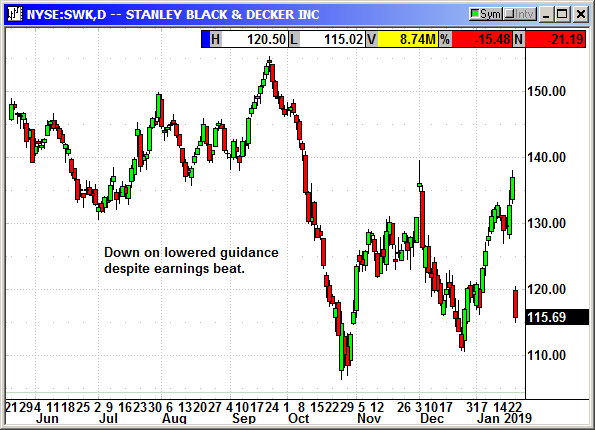 Earnings were not kind to Stanley Black & Decker (SWK). The company reported earnings of $2.11 that edged out estimates by a penny. Revenue of $3.63 billion barely edged out estimates for $3.62 billion. The problem came in the guidance. The company predicted earnings for fiscal 2019 of $8.45-$8.65 and analysts were expecting $8.79. The company is in the middle of a large $250 million restructuring program that is impacting costs in the short term. Investors need to focus. Revenue hit the target, restructuring costs are impacting earnings, Home Depot has not reported any sales declines. Unfortunately, SWK shares fell $21 on the news. Buy the dip once it finds a bottom. 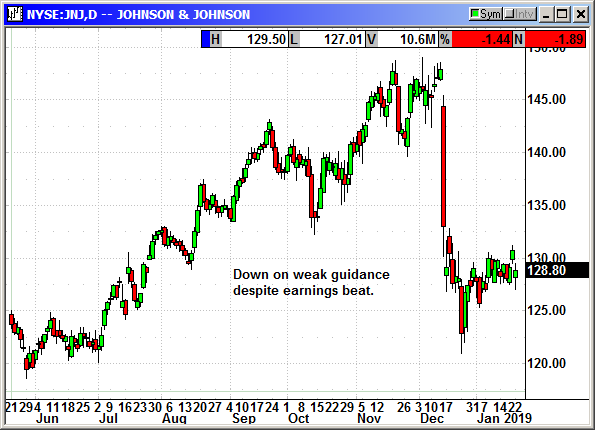 Dow component Johnson & Johnson (JNJ) reported earnings of $1.97 that beat estimates for $1.95. Revenue rose 1% to $20.4 billion and beat estimates for $20.2 billion. They guided for 2019 revenue of $80.4-$81.2 billion and earnings of $8.50-$8.65. Unfortunately, analysts were expecting $82.61 billion. In other news the company settled with 46 states for $120 million on prior sales of metal-on-metal hip implants. The maker of the implants, DePuy said the settlement involved no admission of liability or misconduct. According to the states, J&J made misleading claims about the longevity of those implants and led to patients having to undergo revision surgery before the company's advertised life span of 5 years. In 2010 DePuy recalled 93,000 of its hip implant systems and paid $2.47 billion in expenses. 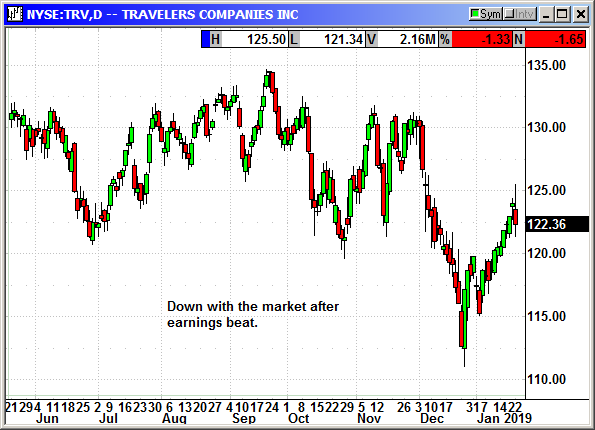 Travelers (TRV) reported earnings of $2.13 that beat estimates for $2.10. Revenue of $7.7896 billion easily beat estimates for $6.763 billion. Catastrophe losses rose from $499 to $610 million because of the California wildfires. All their business lines showed improvement except for its commercial auto business. Shares declined with the market. 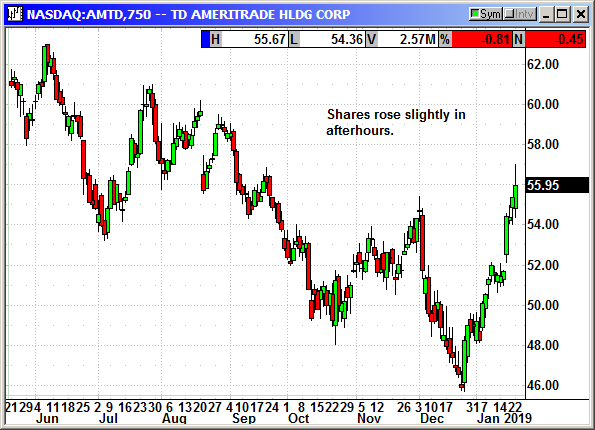 TD Ameritrade (AMTD) reported earnings of $1.11 that beat estimates for $1.00. Revenue of $1.52 billion beat estimates for $1.47 billion. New client assets rose 10% to $32 billion. Average client traded rose 28% to 928,000. Average mobile trades rose more than 50% to 240,000. The CEO said investor sentiment shifted due to the macroeconomic uncertainty that moved the markets. This prompted more trades. Shares rose slightly in afterhours. 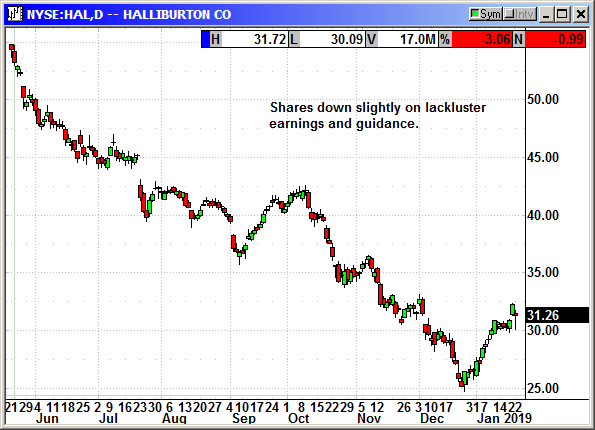 Halliburton (HAL) reported earnings of 41 cents that beat estimates for 37 cents. Revenue of $5.94 billion beat estimates for $5.86 billion buy was flat year over year. A decline in fracking services led to an 11% drop in North American revenue to $3.3 billion. The company plans to cut capex spending by 20% to $1.6 billion in 2019. Halliburton's vision of the industry was somewhat more sedate than competitor Schlumberger. 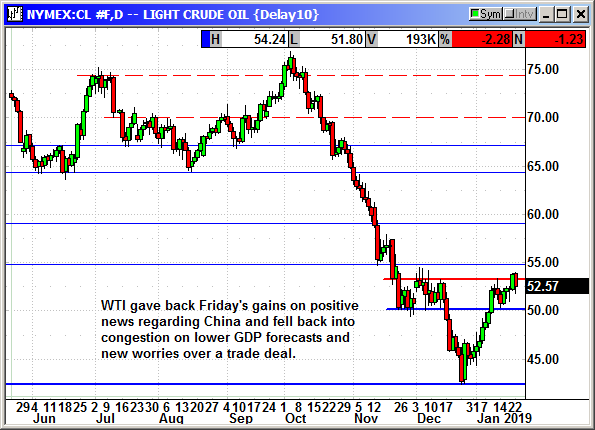 SLB was upbeat when they reported last week. After the bell the first big tech stock reported strong results. IBM reported earnings of $4.87 that beat estimates for $4.82. Revenue of $22.54 billion beat estimates for $21.73 billion. For the full year they reported $13.81 in earnings compared to estimates for $13.79. They guided for fiscal 2019 for earnings of "at lease $13.90" while analysts were predicting $13.79. Cognitive solutions revenue was $5.46 billion that beat estimates for $5.27 billion. This includes the Watson unit. Cloud revenue was $8.9 billion and missed estimates for $9.04 billion. The global business segment saw revenue of $4.3 billion that beat estimates for $4.15 billion. Overall revenue declined slightly due to the sale of some software assets to HCL Technologies for $1.8 billion. IBM is paying $34 billion to acquire Red Hat and the deal is expected to close in the second half of 2019. This will be a transformational event according to Keybanc. It will revolutionize IBM's cloud offerings. Shares rose $8 in afterhours. 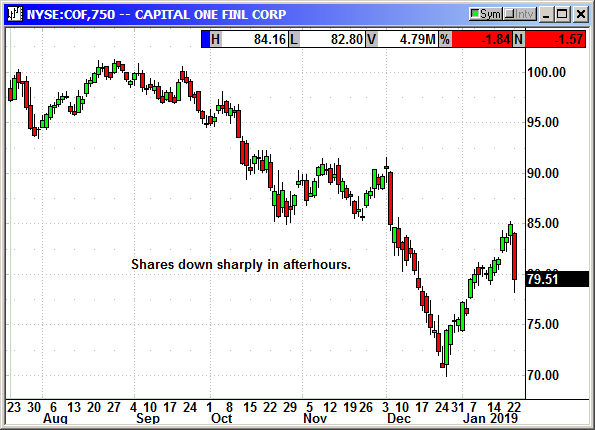 Shares of Capital One (COF) declined 3% in afterhours after reporting earnings of $2.48 that beat estimates for $2.39. Adjusted revenue rose 1% to $7 billion and missed estimates for $7.1 billion. For the full year earnings were $11.82 on revenue of $23.08 billion. Ebay (EBAY) shares soared 8% at the open after Elliott Management sent a letter to the board laying out a five-step plan that could lift shares to $55-$63 by the end of 2020. Shares are currently at $33. Elliott said Ebay could spin off the "market leading" StubHub business and the Ebay Classified Group that once owned 25% of Craigslist. Now Ebay Classifieds is a collection of ten brands around the world that cater to local shoppers in their own neighborhoods. Elliott said spinning off those businesses would return value to shareholders and allow management to focus on running the core Ebay business and move beyond its history of "inefficient organizational structure, wasteful spending and misallocation of resources." 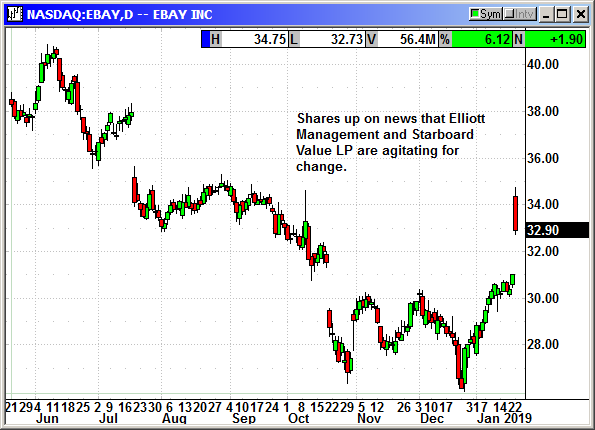 The WSJ reported that Starboard Value LP also wants Ebay to think about separating those businesses. With two activist shareholders in the mix, something may eventually get done. 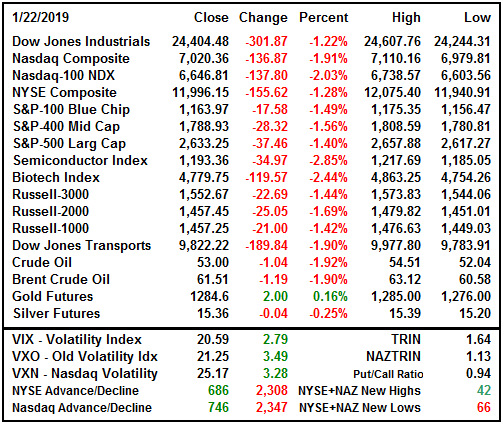 Crude prices declined with the market on worries about China's GDP growth, the IMF's global slowdown warning and the potential for the trade deal to die. All of those events project slower growth in oil demand. This should be only temporary because the OPEC+R production cuts are in full swing and January production should be down sharply. Today was a headline reaction day. Nothing changed in the market. While there were some less than exciting earnings the majority are coming in as expected. The combination of the IMF economic warning and decline in China's GDP over the weekend, put the market in a defensive posture before the open. 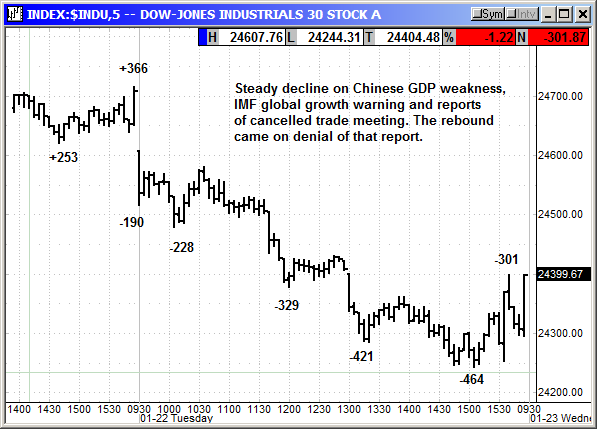 The bogus story about the cancelled meeting was just additional grease for the market slide. With Kudlow claiming the meeting cancellation was fake news, the market rebounded into the close and the S&P futures are up slightly at +8. 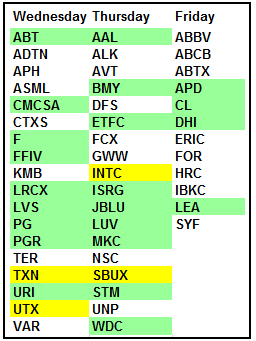 Anything can happen before the open but as of this evening it would appear Tuesday could be either a one-day wonder OR the opening round of some multiday selling in an overbought market. If we do get additional selling, I do not expect a material move lower this week. 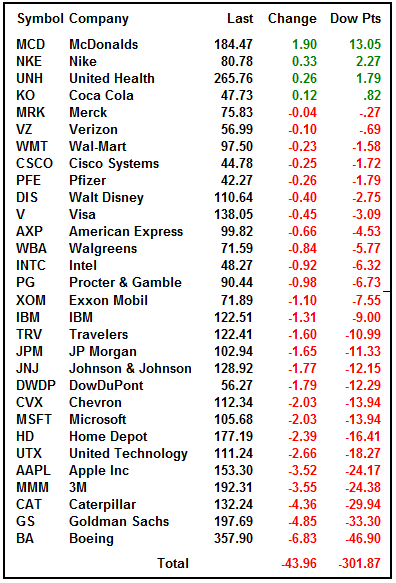 The Dow was handicapped by the four most tariff sensitive stocks taking a serious dive. 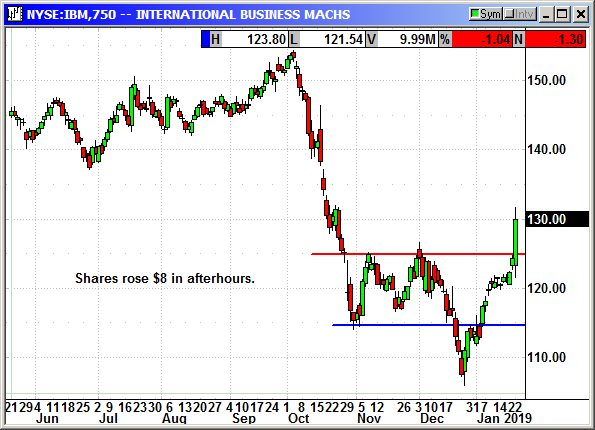 Boeing, Caterpillar and 3M were hammered. The SWK earnings caused a $2 drop in Home Depot, down more than $4 intraday, and Apple was back in the tariff hotseat even though they have not yet been impacted. Like BA and CAT, they are always mentioned in tariff discussions but are so far untouched. The Dow stopped exactly on resistance at 24,750 on Friday and today's decline was just a normal bout of headline profit taking. However, if Tuesday's low of 24,244 is broken, an entire army of analysts will surface predicting a retest of the December lows. 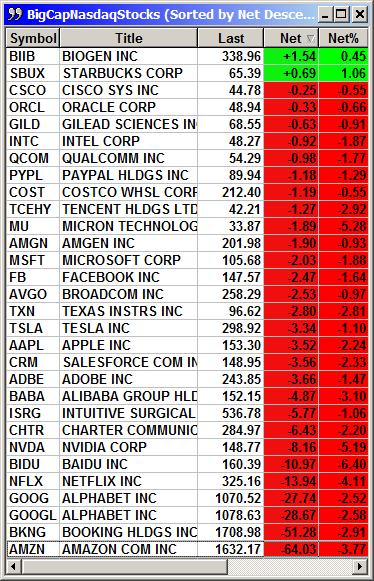 Tech stocks were crashing with the index down -178 intraday. Amazon closed 23 points off its lows but still lost $64. The Jeff Bezos divorce is getting more play in the analyst community because nobody knows how his 16% ownership of Amazon will be split with his wife. Google/Alphabet is weak as the privacy issues seem to pick up steam around the world. Netflix was weak on continued post earnings depression but may have found support at $320. Tech stocks should get a sentiment boost from the IBM earnings after the bell and with the approaching Intel earnings on Thursday. Intel is expected to do well because pricing for processor chips has remained firm due to a shortage. 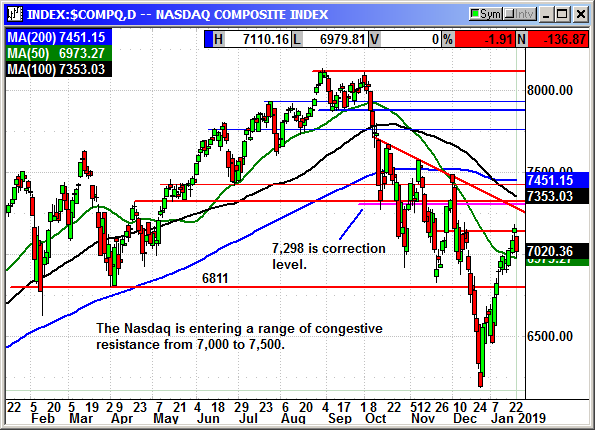 The Nasdaq has minor resistance at 7,150 but it is entering a period of congestive resistance all the way to 7,500. 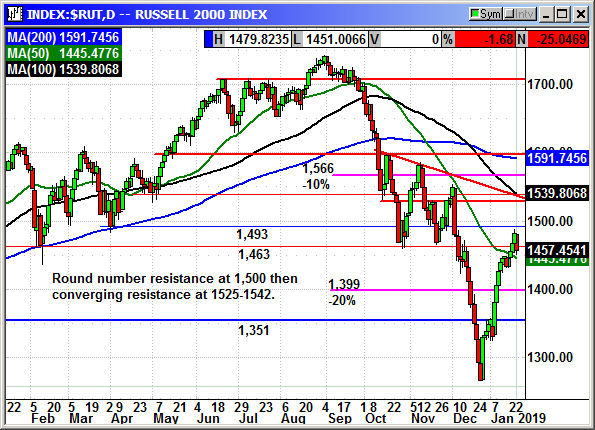 The Russell 2000 was down -31 points at the low and just above short-term support at 1,450. The small caps were due for a sharp decline after the monster rally from the December lows. We need the Russell to rebound back over 1,500 to rejuvenate bullish sentiment. While the market decline today was triggered by a flurry of headlines, we were due for some profit taking. They say the market does not need a reason to decline but it does take advantage of those reasons when they appear. Today could be a one-day wonder. We will not know that until the weekend. Just as the overbought dip was sudden, a short-term oversold rebound can be just as sudden and neither have any relation to the market trend. These are just reactions. I still believe we should be buying the dips until proven wrong. If you like the market commentary you have been receiving and you are on a free trial then now is the time to subscribe. Don't wait until you miss a newsletter to decide you want to take the plunge.